I just wanted to say a huge thank you for the time and interest you spent with us the other day. Derek is loving his electric chair and it has given him a new lease of life outside (although he is finding more jobs for me to do in the garden now he is independent) We can only thank you for all that you have done for us and if we can repay the favour in any way please let us know. We can’t express our gratitude enough in words. This is just a note to say a big thank you. I borrowed a wheelchair from you for a week so that I could get my dad around and enable him to be with his family when we went out for walks etc. Many thanks again you all do such a good job. Regards. Julie. 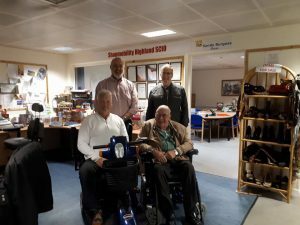 Strokeness would like to thank Shopmobility Highland for the two scooters donated to our members. (Front L-R) Paul Williamson Shopmobility Highland Sectretary, Lachie Smith Shopmobility Vice Chairman. (Back L-R) Norman MacLeod Mnager at Shopmobility, Alan Reeks from Strokeness.